LAS VEGAS -- Tourism continues to be Southern Nevada’s most vital industry, creating record-breaking visitation and unmatched economic impact in 2016. A recent study by Applied Analysis determined that Southern Nevada’s tourism industry continues to generate more economic activity than any other single sector of the region’s economy. Tourism now generates an estimated $59.6 billion dollars for the economy, according to the latest Economic Impact Series presentation delivered by Applied Analysis at the March Las Vegas Convention and Visitors Authority’s (LVCVA) board of directors meeting. In 2016, the total impact of Southern Nevada’s tourism industry supported an estimated 407,000 jobs, representing nearly 44 percent of the total workforce. These jobs generate $16.9 billion in local wage and salary payments. In 2016, Southern Nevada welcomed a record-breaking 42.9 million visitors and the destination expects to break that high once again in 2017. Spending sourced to these visitors noticeably increased in 2016, with total direct spending of $35.5 billion (or an average of $827 per visitor) an increase of 16.3 percent more than 2015’s total direct spending of $30.5 billion (or an average of $721 per visitor). In addition to the growth in overall visitation, Las Vegas also reached an all-time record for business travel in 2016 with 6.3 million visitors in the destination for a meeting or trade show. Convention attendance was the primary driver for tourism growth in 2016, accounting for more than two-thirds of the total increase from 2015 to 2016. Convention traffic is critical to Las Vegas’ visitation mix as business travelers consistently spend more on non-gaming expenditures. In March, Las Vegas was named North America’s No. 1 trade show destination according to the Trade Show News Network (TSNN) “2016 TSNN Top 250 Trade Shows in the United States” list for the 23rd consecutive year. 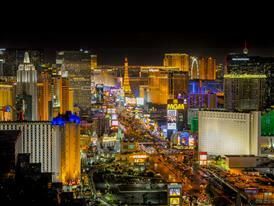 According to the list, Las Vegas hosted 57 of the largest shows held in the country last year. Las Vegas and the LVCVA are committed to maintaining the destination’s reputation as a leader for business travel. In October 2016, the Nevada State Legislature approved legislation to help fund the expansion and renovation of the Las Vegas Convention Center. The project will add 600,000 square feet of exhibit space, new meeting rooms and other amenities, as well as renovating the entire existing property. The project will continue to cement Las Vegas as North America’s premier business destination, allowing shows to grow in both square footage and attendance. Applied Analysis was retained by the LVCVA to review and analyze economic impacts associated with its various operations and Southern Nevada’s tourism industry as a whole.